TMUC is an initiative by Pakistan’s third largest education group; The Roots Millennium Schools Pakistan; where we have been associated with teaching, curriculum, assessments and learning for nearly 30 years and are recognized globally as a center of educational excellence, learning opportunity, teaching entrepreneurship and talent discovery, We recognize the many benefits partnerships and affiliations provide, such as enriching the curriculum and choice of programmes, in terms of the widening the learner’s participation and employability scope, thus facilitating entry into higher education by increasing the number of progression routes for our students. Global collaborations not only provide a diverse learning environment but also increase educational opportunity and promote a mutually supportive environment for staff and students, as well as raising for both university and partner in our education districts. At TMUC Pakistan our goal for every student is to graduate with an international and transformative multicultural and global competency, whether acquired at home or abroad. In partnership with colleagues at colleges, universities and educational authorities across the globe, TMUC is a unique transnational education hub for knowledge, service, learning, innovation, practice and entrepreneurship that infuses experiential and intercultural learning by personally enriching each student’s experience. By scaling emerging models and ideas that could eventually be translated into life-long learning, innovation, education and change for national and global development, we support United Nations’ sustainable development goals and industry marketplace. By providing an eclectic portfolio of transnational higher education qualifications, TMUC vision is to contribute in particular, Roots Millennium Schools Pakistan mission and in general Pakistan’s commitment in developing the right set of skills, attitudes, knowledge, jobs, learning and values for a growing cohort of graduating millennials each year so that they can confidently meet the global challenges of the 21st century economy. TMUC is governed by an award winning and globally celebrated advisory Council with thought, business, research and academic leaders from across the globe. The Millennium Universal College TMUC operates an integrated system for quality assurance and enhancement which makes an effective contribution to the achievement of our strategic Plan; which underpins the academic planning process. The ultimate aim, underpinning our vision, is our commitment to create the best possible student experience. Such a system is sufficiently robust to safeguard the standards of the academic awards and regulatory regime in Pakistan and clearly articulate with the UK Quality assurance code for higher education and in the regulatory eco-system of the countries we serve. TMUC understands the importance of keeping abreast of external developments and best practices in higher education and sees this as part of being a self-critical academic community which evaluates and enhances its quality assurance procedures to encourage that culture. The maintenance and enhancement of the academic standards of the institution depend foremost on the commitment of all our staff continually to evaluate and reflect on the quality of the educational experiences provided for students. TMUC has well-established, comprehensive and rigorous arrangements for the approvals, accreditations, assessments, reviews, teaching delivery, training, modification and annual monitoring of its academic provisions. These arrangements for quality management and enhancement are built upon three decades of our classroom experience and reflection. TMUC has been subject to external audits, quality assurance as well as scrutiny from a wide range of professional boards, examination bodies and statutory regulatory regimes. We are ‘GloCALs’ Global in Recognition; Local in Access. The Millennium Universal College TMUC Pakistan is a private, independently governed, recognized by Higher Education Commission (HEC) Pakistan, a transnational education initiative owned and operated by Roots Millennium Schools Education Group. Roots Millennium Schools is a succession dividend of the Roots Montessori & Schools originally founded in April 1988 by Mrs. Riffat Mushtaq Aizaz-e-Fazeelat. Roots Millennium Schools Pakistan today have achieved academic excellence and all around development of learners for nearly 30 years. The new generation Roots Millennium Schools and The Millennium University College TMUC are founded and governed independently as the brainchild of Mr. Chaudhry Faisal Mushtaq TI, recipient of the prestigious national civil award and national decoration Tamgha-e-Imtiaz – The Medal of Distinction, from the Government of Pakistan through the President of Pakistan for his passion and rich contributions in the field of social innovation, empowerment, entrepreneurship and technology integration in the education sector of Pakistan. Chaudhry Faisal Mushtaq TI is globally recognized as the 500 Most Influential Muslims of the World and thought leader; where he serves on many national and international corporate and not-for-profit boards, chairs and as board of governors. 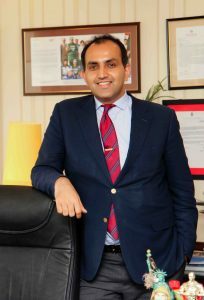 He is a celebrated national educational icon, a household name for classroom education, a school and human capital reformer and is a globally acclaimed educational counselor, who has scaled education, learning, access and teaching as per the aspirations of the 21st century child, commonly referred by him as the ‘Millennial Child’. Faisal Mushtaq. The Millennium Universal College TMUC is Pakistan’s one of the largest transnational education group operating purpose built University Campuses across major urban cities and offering International programmes and highly reputed degrees and skills qualifications at home. Recognized by the Higher Education Commission HEC of Pakistan, TMUC is an institution of higher learning dedicated to providing innovative undergraduate, postgraduate, MBA, professional, skills, accounting, innovative sciences, fashion, design, media and business education. By bringing a range of international qualifications home, TMUC aspires to be recognized as the leading University College for borderless education, committed to providing opportunities that exceed local stream of education, choices and access for the youth of Pakistan; which is the sixth largest youth cohort in the world. TMUC is currently a provider of transnational education programmes; we have articulated many collaborative, affiliated and partnership arrangements with renowned International institutions, Universities of Higher learning, Professional Bodies, Global Assessment Associations with professional and higher education portfolios. From a Foundation Diploma to a postgraduate degree or Professional Certification, there is a programme to match diverse choice groups, professional needs and career requirements. We believe education is a right not a privilege. Preparing students for their future career choices is a key strategic goal for TMUC Pakistan. For example, all our students are expected to attain core employability skills, developed in consultation with employers, to ensure students meet employer’s skill needs. Our focus is developing students for their chosen professions and we have a rich tradition of helping them achieve excellence and success. Roots Millennium Schools RMS Education Group RMS is Pakistan’s first and growing ISO 9001:2008 Certified Group of International Schools operating across Pakistan. We are a private independent award winning school system that is providing teaching & learning for nearly 30 years, with the largest K-12 teacher training institute, 8000 plus active alumni, and an access to over 25 educational qualifications affiliated with 12 prestigious international examinations & qualifications boards globally. We have pioneered 15 school academic enrichment and language programmes, Pakistan’s first Microsoft Mentor School, Global Showcase School and award winning author of Intel-Roots Skills for Success ICT Curriculum and teacher training programmes .We are Pakistan’s first Confucius Classroom with 6000 students learning mandarin on Full Time bases and with more than 250 active partnerships & affiliations with organizations in different industries, academia, corporate sector and non-profit sector, maintaining linkages and MOUs with over 500 Universities, institutes of higher education, partner organizations and governments. Roots Millennium Schools Education Group has a growing strategic presence in 20 major cities across Pakistan through our own sustainable designed, custom built schools with more than 50 purpose built state of the art educational campuses nationwide with an incessant increase in student population to 16,000 students today. Welcome to tomorrow, the future of Education. TMUC aims to be an institution of higher learning dedicated to providing innovative undergraduate, postgraduate, and professional education. By bringing a range of international qualifications home, TMUC aspires to be recognized as the leading institution of borderless education, committed to providing opportunities that exceed local stream of education to the youth of Pakistan. TMUC is currently a provider of transnational education; we have collaborative arrangements with renowned foreign institutions with professional and higher education portfolios. From Diploma, to Bachelor and Professional Certifications, there is a programme to suit your preference, professional needs and career requirements. At TMUC our goal is for every student to graduate with international and transformative multicultural and global competencies, whether acquired at home or abroad. In partnership with colleagues in colleges and units across the globe, TMUC is a unique hub of research, service learning, internship and community projects that infuse experiential and intercultural learning and personally enriching experiences into our students’ portfolios. The students at TMUC will undertake basic and applied research with a view of revolutionizing the study of entrepreneurship, leadership, technology, social and management sciences and many more; hence scale emerging models and research that could eventually be translated into life-long learning, innovation, education and change for national development. By providing an eclectic portfolio of transnational higher education qualifications, TMUC would assist Roots Millennium School’s mission and commitment to developing the right set of skills, attitudes, knowledge and values within graduating Millennials so that they can confidently meet the global challenges of the 21st century. Please accept the assurance of our highest commitment and utmost cooperation in this regard. I assure you of my wholehearted dedication to the field of education in Pakistan. to create, curate, preserve and disseminate knowledge. to become a dynamic, global, and enterprising educational institute. to cater to the educational needs and ambitions of Millennials with global aspirations.